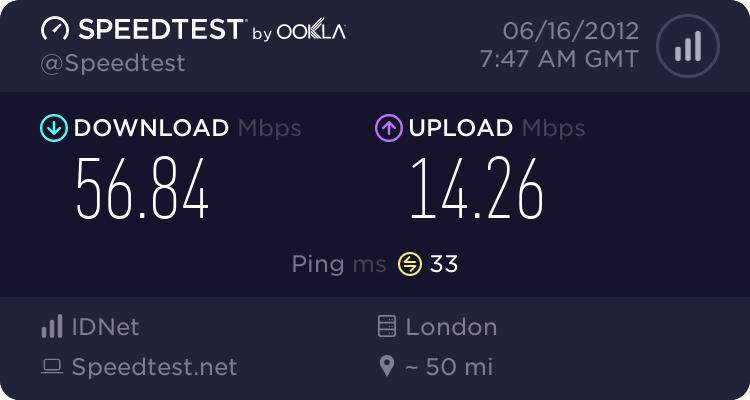 I hope this isn't just the end of the honeymoon but my IDNet FTTC connection isn't doing very well any longer. For the past two evenings (Tuesday/Wednesday) the download has been variable and struggled to get above 30Mb/s most of the time. Previously it would reliably hit at least 55Mb/s and was often around 60Mb/s. Upload is unchanged. I eventually got the BT Speedtester to give me a result (on the sixth attempt, [censored]). It says my profile is 76.7Mb/s so I guess I'm looking at congestion somewhere. Rather curiously the latency reported by Speedtest.net to my usual server is only 15ms. It used to be 35ms. I'm seeing something similar, my ping has dropped from 22-23mS to 11mS, though the drop in speed (using speedtest.net and tbb) is only a couple of Mbps from it's usual 65-66. It looks like the routing has changed somewhere. I'm using a London server (from South Oxon), how about you? eta- there's been no change in ping on my BQMs, they're still around 12mS. Yeah I'm using Namesco which is a London server. I'm in South Northants so not a million miles from you albeit probably a different node. I think we ultimately hang off Birmingham. I'm seeing the same poor results from everything. TBB shows about 20Mb/s, that VisualWare test does (interestingly that test also shows 'out of 76Mb/s' though I don't know where it gets that from). When the recent Win8 release candidate was released I downloaded both ISOs and got 6.8MB/s. I tried again last night and it was only 3MB/s. Noticeable variable as well. Up till now my speedtest.net results have jumped straight up to 50Mb/s then in the last few seconds moved higher to 55Mb/s or 60Mb/s. Since Tuesday they've gone straight to about 20Mb/s then jumped all over the shop. In fact it seems that the upload is a bit affected as well - I hadn't noticed that. Edit:I've raised it with IDNet support but I don't know if/when they'll get back to me or what their response will be. My first 'complaint' so it'll be interesting to know how they deal with it. I tried a few runs using the VisualWare test, like you it's giving pretty much the same results as the others. 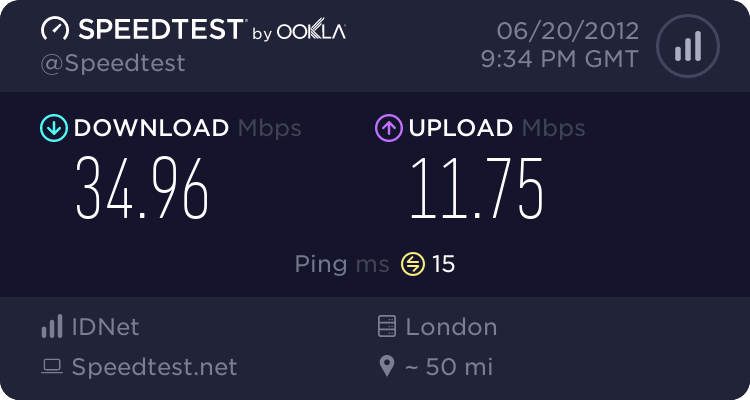 Generally around ~61Mbps out of ~64Mbps with both London and Maidenhead servers. That "out of" figure is intriguing... it can't be BT's IP profile for a variety of reasons, mainly because it varies between tests! So it's not just IDNet... I wonder if there could be any connection with this, ie BT are messing about with the network for their multicasting service? My first 'complaint' so it'll be interesting to know how they deal with it. I've always found them to be pretty good, but in view of bobbyboyuk's comment I've got a nasty feeling that this one may be outside their control. well my connection been on and off a few times , lights on modem ok etc. Same here on the Infinity business service, although it seems to be settling down. Routing seems to have changed following a reconnection early yesterday morning and latencies have dropped: the first external router from 11.5 ms to 9.1 ms, and my fastest BBC site (212.58.244.59) from ~19 ms to 14.4 ms.
My dynamic IP address is now geolocated in Chesterfield (previously London) but my static IP addresses are still thought to be in Kent. I'm actually in north-east Wales.